The FIRE RIBBON is an example of exquisite, modern design and has a mesmerizing dancing ribbon of flame. 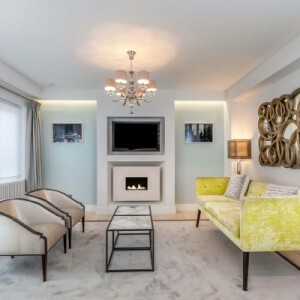 This high quality gas fire has a flame quality unrivaled anywhere and is the choice of architects and designers around the World. 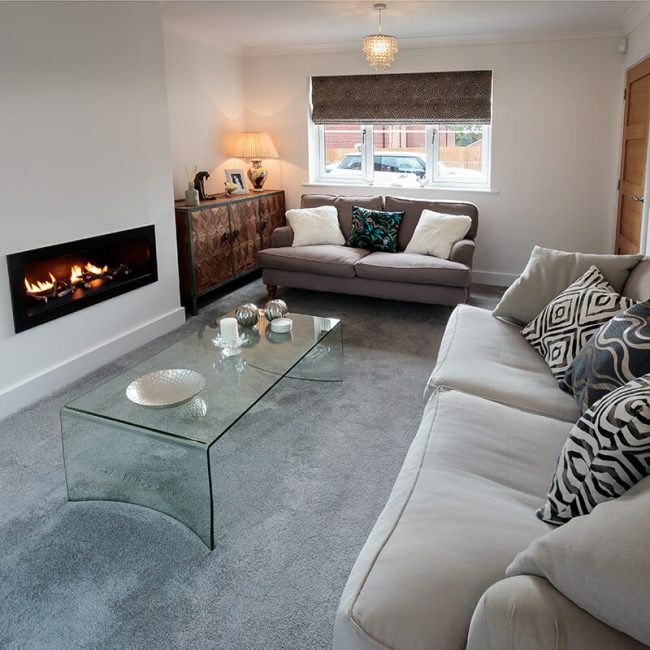 The contemporary gas fire is supplied as a complete fireplace package including Ribbon Burner, Enclosure, Remote Control System and Natural Stone Fascia. The gas fire burner is operated by a remote control system which includes a thermostatic function which can control the room temperature. The FIRE RIBBON is an example of exquisite, modern design and has a mesmerizing and dramatic dancing ribbon of flame. 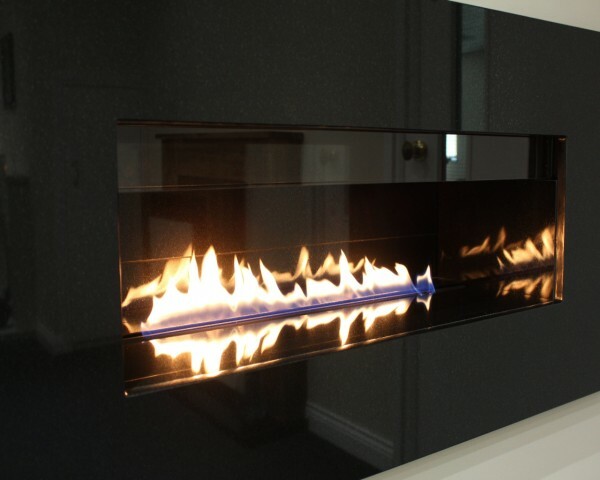 This high quality gas fire has a flame quality unrivaled anywhere and is the choice of architects and designers around the World. 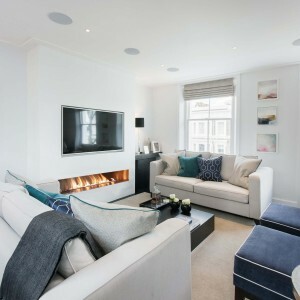 The contemporary gas fire is supplied as a complete fireplace package including Ribbon Burner, Enclosure, Remote Control System and Natural Stone Fascia. The fascia is made of 20mm thick solid natural stone, which is 1350mm wide and has an opening width of 845mm. 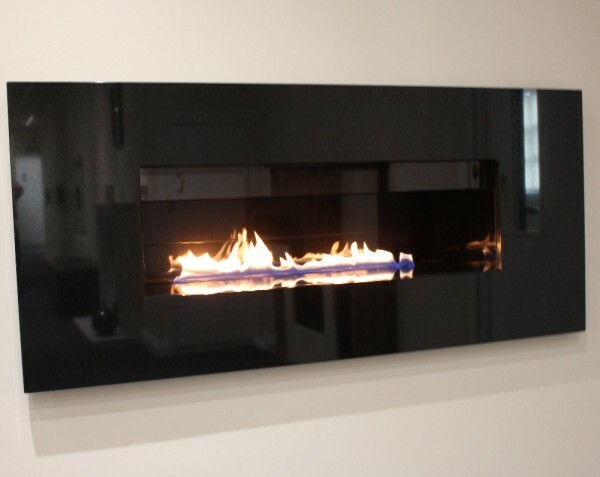 The gas fire burner is operated by a fully sequential, battery powered, remote control system which includes a thermostatic function which can control the room temperature. Please read the Fire Ribbon technical information prior to ordering. Thermostatic Control – when using this feature the handset can be set to the desired room temperature. The handset will then monitor the room temperature and adjust the flame to maintain the correct level. This saves energy and running costs are reduced. 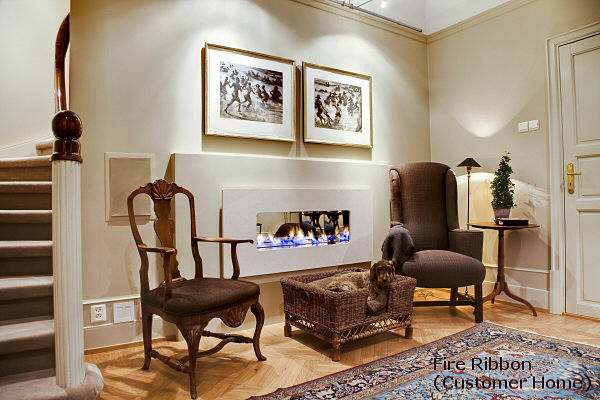 Minimum Depth – the fire has been designed with an overall depth of only 315mm this make it suitable to be installed in most old and new properties. Ventilation – when buying the Class 2 version of this fire no room air vent is required. Flue System – the fire can be used with a wide range of chimney types, class 1 or class 2, and either a 127mm flue liner with a minimum of 3m length or 175mm flue liner with a minimum of 2m length. The type of chimney you will be using needs to be specified at the time of order. If in doubt about which version you require please call sales before ordering to discuss the best solution. 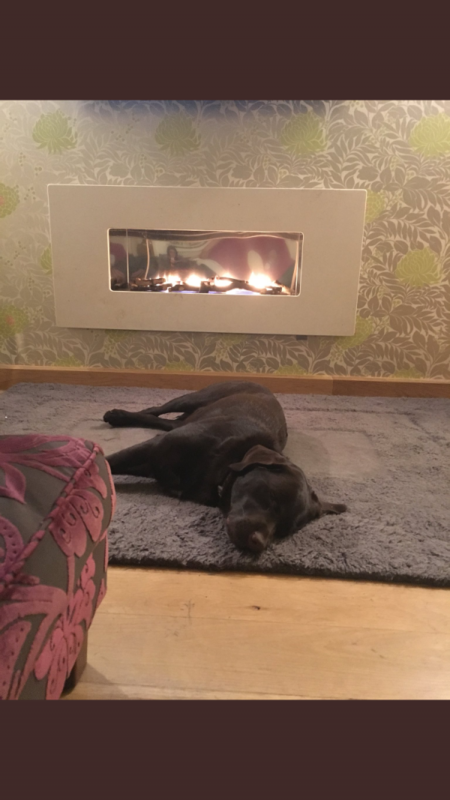 Class 2 – On this version there is a small 60mm glass slip at the top of the enclosure which then allows the fire to be fitted with only a class 2 or 125mm flue pipe, and there is no need for an air vent in the room. The fire can still be fitted into larger chimney sizes and used with larger flue pipes however the gather is supplied on this version with a 130mm diameter spigot. Class 1 – On this fire the gather is supplied with a 180mm diameter spigot and there is no small glass panel at the top of the enclosure. This version will require an air vent of 100cm2 within the room. Enclosure: Choose from Polished Steel, Matt Black with Polished Shelves, Choice of Natural Stone (see below). Fascia: Choose from Limestone, Black Granite, Unfilled Travertine, Grey, Leathered Black, Green Limestone and many others upon request. Gather: The gather is specially designed to link the enclosure to a flue liner and has either a 130mm or 180mm spigot depending on which version is purchased. We strongly advise buying the gather even if the fire is to be fitted into a brick built chimney. The gather will prevent debris falling into the opening from the chimney, stabilize the flame and maximize the efficiency. Power Supply: The fire is powered by batteries making installation easier and cheaper. 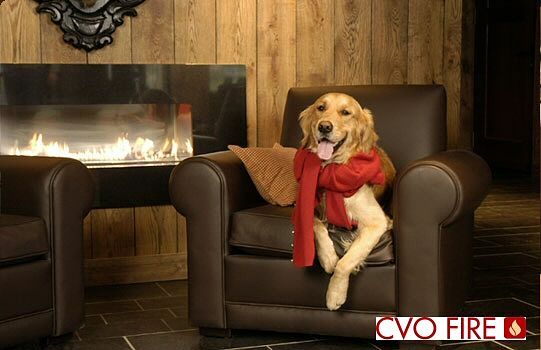 CVO designed and launched the FIRE RIBBON ® in 2002 and we own the European Trademark. Visited a few showrooms before deciding on the CVO ribbon fire. Best quality and best flame. 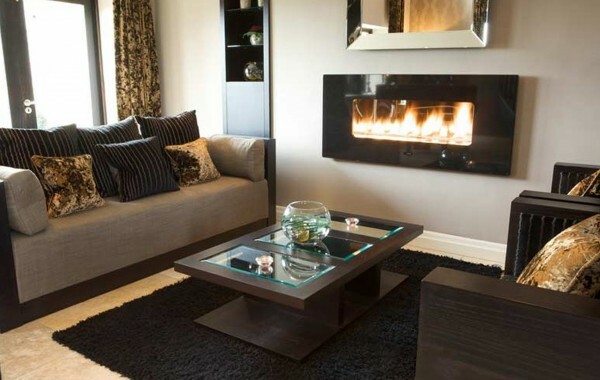 After seeing and buying this fire it looks great in my front room, Provides plenty of heat and looks stunning too.